I love participating in this meme because it gives me the chance to write as much about a character as I want. With reviews, I feel the need to rein in the character discussions somewhat in order to talk about the book as a whole. I think Warner is a character who would agree with me that a single paragraph devoted to him is nowhere near sufficient. This guy . . . . Where to start?! From the moment he showed up in Shatter Me, he commandeered my brain, messed with it repeatedly (and he's probably not done yet, either), and refuses to be dislodged from it. Seriously, I haven't been able to stop thinking about him since I finished Unravel Me a few days ago. This isn't even a love-hate type of situation here. I am utterly fascinated by Warner's character. Every time Juliette and I believe we might have made a sliver of progress figuring him out, he does something unexpected. That may be putting it mildly. I just started reading this series..I am enjoying it though I really hated Warner in Book 1..just started Book 2..and I am curious to see what redeems him in this book! I tend to go for the bad boys, so I loved Warner from the start, lol. My cousin couldn't stand him in Shatter Me, but Unravel Me totally changed her mind. Can't wait to see what you think of the book (and Warner) once you've read it! I am about half way done with Unravel Me and I am starting to get it..he is really damaged and complex..I felt sorry for him several times and the moment with the dog made me sympathize with him. Still I think of all the male characters I like Kenji the most though I totally don't ship them together..I really think he would be bad for Juliette but I like him the best. I could see Warner being a good match because they are both so damaged! I tend to like the dark/complex characters best as well! I think they are much more interesting..and Adam is pretty bland to me..mopes to much! I love Kenji! He's hilarious! I don't ship him and Juliette, though, either. To me, he's become the voice of reason in Unravel Me, repeatedly telling Juliette and Adam to both snap out of their moping, lol. 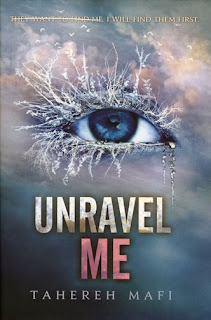 I am definitely going to pick it up and I plan to do a mini-review of Shatter Me, Unravel Me and Destroy Me all together..because I really am enjoying this series...it is really well written, love the prose style..though weirdly I think Unravel Me is a better book than Shatter Me! I knew that I should have despised him in Shatter Me, but I just couldn't. I loved that he was deranged! 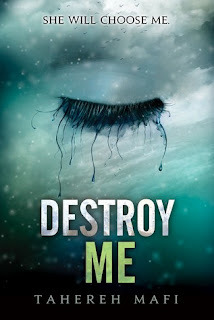 Destroy Me showed a totally different side to his character, which I also loved. I was kind of impatient with the beginning of Unravel Me because all I could think was, "Where's Warner?!" When Juliette sees him at the compounds- such a pivotal moment, and one of my favorites in the series. I'm still P.O. 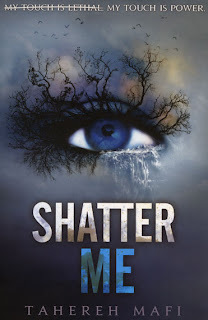 'd that our library lost their copy of Shatter Me! That's awful! I hope they get another one, because it's so worth reading. I've noticed that my library's online catalog will sometimes say that it doesn't have a book at my local branch, yet a copy will be there on the shelves. Go figure. You can also try digital libraries if you have a nook or kindle. I use one that several libraries use & many times it has books that my library doesn't have a hard copy of! I love Warner!! I never liked Adam, so while reading Shatter Me I kept trying to rationalize what Warner did so I could like him completely instead xD Good thing I don't have to keep doing that lol. I'll be waiting to hear what you think of him, hehe! I thought that the strikeouts in the text would bother me, but they didn't at all; in fact, they made the prose really unique, and it's quite a powerful effect.